The Berbice Bridge Company on Tuesday announced increased tolls from November 12, 2018 after refusing government’s offer to service the bridge pontoons. The decision to hike the tolls, according to the company, was done based on legal advice from the law firm of Cameron and Shepherd whose principals include Attorney-at-Law, Ralph Ramkarran. operational cost of the Bridge and would do nothing to improve the revenue of the Bridge. He noted the Bridge has invested GY$167 million in acquiring equipment to service the 39 pontoons on which the bridge float. 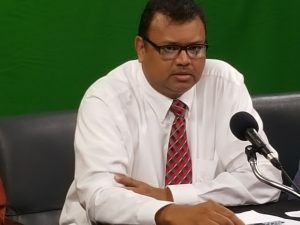 The Chairman of the bridge company’s board, Dr. Surendra Persaud said government with Public Infrastructure Minister, David Patterson on October 11, 2018 in keeping with the Berbice Bridge Act 2006 and at that meeting, Patterson informed that government “was not going to facilitate our request for the toll adjustment that is covered under the Public Private Partnership between the Government and the Private Investors in the bridge under the Concession Agreement. “The Minister, instead, proposed that Government undertake the responsibility, only, for servicing the bridge pontoons and offered to arrange a meeting with the honorable Minister of Finance for further consultation. These options are outside of the contractual arrangements that exist within the Concession Agreement and are in breach of our Agreement,” Persaud said. Dr. Persaud declined to comment on whether he was concerned about the political impact the increase could have on the Alliance For Change political party of which he is a staunch supporter. Public Affairs Consultant, Kit Nascimento said Public Infrastructure Minister, David Patterson rejected the company’s decision to hike the tools because of political implications. Persaid said the Company has unfortunately, has accumulated losses in excess of G$2.8B, has never paid dividends to its ordinary shareholders and is now in default of obligations to its numerous stakeholders, including the National Insurance Scheme.